VENTA DE PRIMAVERA 20% DE DESCUENTO - SMACK DAB EN LA PLAYA! Piscinas, Bañera de hidromasaje - FAM FAV! 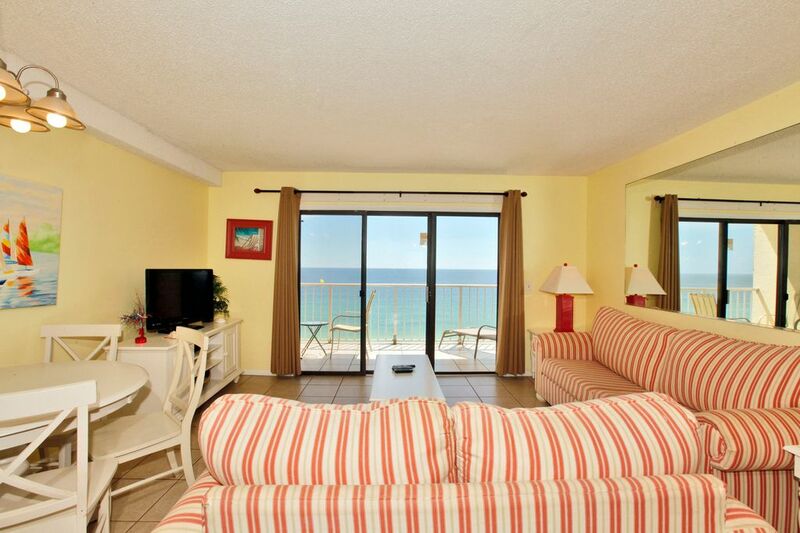 Alquiler de condominios Summit en Panama City Beach, FL es un favorito desde hace mucho tiempo para muchas familias. Conocido por su ambiente familiar y gran variedad de servicios, es fácil ver por qué la cumbre es uno de los centros turísticos más populares en Panamá City Beach, Florida. La Cumbre de vacaciones piso Beach Resort 1307, es una zona de dormitorio y literas 1, 1 cuarto de baño además un medio baño condominio frente al mar directa con fantásticas vistas de la playa y del Golfo. Piso 1307, cuenta con una decoración acogedora, junto con todas las comodidades del hogar. Disfrutar de hermosas vistas desde el balcón grande durante su estancia. ¡Bienvenido a su hogar lejos de casa! The Summit Resort en Panama City Beach, Florida tiene una ubicación céntrica y es el lugar perfecto para sus vacaciones familiares. La Cumbre ofrece una amplia gama de servicios para todos los gustos. Los servicios de playa están disponibles si desea alquilar sillas de playa, motos acuáticas o tomar una aventura de parapente. Las posibilidades son infinitas en The Summit Resort. La Cumbre está situado junto al club de Lavela y cerca de actividades para toda la familia, como el Museo de Ripley, Shipwreck Island Water Park, Zoo World, Gulf World Marine Park, Bungie licencia salta, golf en miniatura, coches de choque y de go-cart pistas de rodadura. Worst place I’ve ever stayed. This place was very dirty. By far the worse place I have ever stayed. Not sure the last time they mopped the floors. We ruined several pairs of socks. Had to wear shoes or socks or your feet would be black!! We went and bought sheets to lay over the furniture so we felt clean after sitting on the couch. There was no curtains on balcony windows the dishwasher didn’t clean the dishes. The master bath had 1 out of 3 bulbs working. The tv speaker was blown so watching tv it was all distorted. So to say the least we will not be back. The unit was nice. Beach view is amazing. Alot of shops and places close. Front desk was not so nice nor helpful. The condo matched the pictures well. The balcony was great. I did not do my research prior and did not know that Club La Vila was next door, every night we could hear the music loud and clear from the Club. The frig smelled like sour meat and the place was well loved by lots of parties in the past as it appeared. The condo complex was full of high school senior graduation trips. People would yell "pick up lines" at us or just trying to get our attention when walking back to elevators from pool/beach. Beach Access was nice as was the pool bar. Overall we enjoyed our stay however we will not be staying here again.